In American women, breast cancer is the most common cancer and the second-leading cause of cancer death. While routine screening helps to detect breast cancer, existing technology frequently identifies suspicious lesions that turn out not to be cancer. In fact, up to 80 percent of the biopsies performed reveal the suspicious areas are not cancerous. A team of scientists at Washington University in St. Louis is evaluating a noninvasive imaging technique that could help radiologists differentiate cancer from benign tumors and thereby significantly reduce unnecessary biopsies, health care costs and stress for patients. Quing Zhu, professor of biomedical engineering in the School of Engineering & Applied Science and of radiology in the School of Medicine, and Steven Poplack, MD, professor of radiology at the School of Medicine's Mallinckrodt Institute of Radiology and a breast-imaging radiologist at the Siteman Cancer Center at Barnes-Jewish Hospital and the School of Medicine, received nearly $2 million from the National Cancer Institute at the National Institutes of Health (NIH) to investigate the technique and its effectiveness over the next five years. Zhu uses ultrasound-guided diffuse light tomography, an imaging method that relies on near-infrared light to get a better look at the blood vessels within the suspicious mass. Her unique approach uses a commercial ultrasound transducer and near-infrared optical imaging sensors mounted on a hand-held ultrasound probe. The ultrasound locates the mass in the breast, and optical sensors take images of the total hemoglobin concentration in the mass. Hemoglobin, which is carried by red blood cells, absorbs the near-infrared light. A higher level of hemoglobin raises suspicion for cancer, while lower levels reduce suspicion. 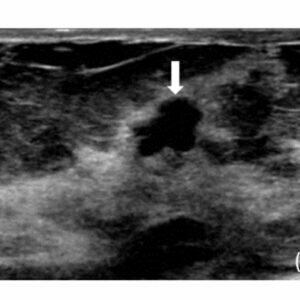 Zhu, a pioneer of combining ultrasound and near-infrared imaging modalities for cancer diagnosis and treatment assessment, and her team recently performed a retrospective study of 288 patients with breast tumors to assess the potential clinical impact of their technique on the decision of whether or not to perform a biopsy. Using a conservative threshold for the total hemoglobin present in the tumors as well as the clinical evaluation by two radiologists, Zhu's team found that the number of referrals for biopsy would have been reduced by 45 percent with the optical imaging technique. To test the method, Zhu and Poplack's team is planning a clinical trial that will involve about 300 patients recruited from the Joanne Knight Breast Health Center at Siteman Cancer Center. The patients will have undergone mammograms that have identified suspicious lesions and will be referred for biopsies. When breast tumors are identified through imaging, they are rated on a scale of 2 to 5, with 2 being benign and 5 being highly suggestive of cancer. Biopsies are generally performed on a tumor rated 4 (suspicious) or higher, although the majority of abnormalities that are sent for biopsy are found to be benign. "Before the biopsy, these patients will have the ultrasound-guided diffuse light tomography scan," said Poplack, also the Ronald and Hannah Evens Endowed Chair in Women's Health at Barnes-Jewish Hospital. "We'll ask the radiologist to decide how suspicious the tumor is based on conventional imaging, then we'll give them the information from the diffuse light tomography and ask if their assessment changed." In addition, a smaller group of patients will undergo conventional imaging then a contrast-enhanced mammogram (CEM), in which patients receive an iodine-based injection prior to mammography. In general, cancerous tumors absorb the iodine-based material more than benign tumors or normal breast tissue. Similar to the adjunctive use of diffuse light tomography, radiologists will determine if their initial assessment changed upon reading the results of the contrast-enhanced mammogram. Zhu and Poplack will compare the results of both the ultrasound-guided diffuse light tomography scan and the contrast-enhanced mammogram to determine if either method could be used to eliminate the need for some biopsies and how frequently the two technologies agree. "One of the nice things about optical imaging is that you have very objective criteria," Poplack said. "We can calculate the hemoglobin concentration—an objective number—and based on previous experience, establish rules that say below this concentration, the likelihood of cancer is really low, and above this concentration, the likelihood is really high." The optical imaging technology presents no harm to patients and is very inexpensive to use, Poplack said. "It has a lot of potential and promise as a diagnostic application, and that's why we want to evaluate this technology in a clinical trial," he said.